As discussed with Andrew during our recent advisor meeting, and as I had written in my October 15th post, I had been thinking of converting my suggested sound piece project into a video. I have sounds of Hitler’s speech and the interview I did with the Holocaust survivor, yet I wanted in my juxtaposition of Holocaust experiences also show images of right wing extremists demonstrating in Dresden’s streets. Since these new right wing extremists are now fighting against refugees from Syria to come to Germany, I had the idea to interweave an interview I had done with a refugee from Syria in Berlin in the spring of this year and show images of Syria and the war. I am playing with this idea and have started to put this together as a video piece. So I discussed this idea with Andrew and he said I should go ahead and experiment with that video. I have had some feedback from Derek, Malvina, Gabrielle, Kayoko, and Jay. By some it was suggested that I put the translated text of the poems as subtitles in the video, but I have decided against it, because I want the images to speak. During my workshops in the summer Jean-Marie encouraged me to work with my voice, so I used it a couple of times (in German) in those films. If this video might ever be presented in a gallery space, the translated text of those poems could be provided in a different way…. I would love to get your feedback on this, also I was wondering if there was a chance that I show it in NYC? I had started this painting with several layers of brush strokes and now, instead of overlaying a map, I would like to include a structure, like a building, the unfolding building of that factory that is now where once was the forced labour camp. As far as the black and white painting is concerned. Andrew asked me if it was finished and we decided that it was not finished. In a way, I have added the two layers of history, had zoomed in more, as I had planned. However, this does not work as a painting…..
….So what I did was to look up maps of all concentration camps and created a map on the canvas. Then, in order to add ‘structure’ to that painting I connected those camps with lines, of different colours. Which could represent kind of a system. So you see…..we really need to talk soon Andrew…..
Also, in the meantime, I had finished two plexiglass pieces that I had started in the summer, that talk about the Camp Moschendorf I was referring to earlier.....here they are....the white shape of the factory building today is on the plexiglass, the former Nazi camp buildings are the black shapes underneath the plexiglass. As I said, I only finished them recently but had started them in August already. I want to abandon the plexiglass, it makes the paintings too structured.....lets discuss please. 3. Miscellaneous, art exhibitions, etc. - There was a review to my recent art exhibition at the Jewish Art gallery of Vancouver and the Jewish Senior Magazine just published an article (and cover) in their fall edition: www.jsalliance.org. The article is on page 24, there is also a link to an interview I had done with the Jewish Independent. - Here are some images of my art exhibition in Edmonton that ran from October 14th to November 7th. - My new German Gallery, Galerie Hoffmann Contemporary Art has invited me and my work to take part at the Cologne Art Fair 2016, which took place last weekend. 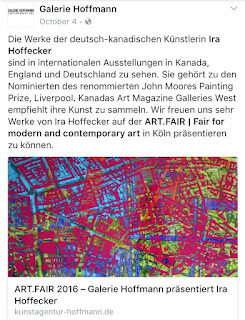 Here is their announcement for the Art Fair. Ira, this is such a great post. Before we even got to Berlin I was emailing you how much I liked your work, and it's great to see even more of it here. Re: the video, I already commented on that (and I support all your decisions in tweaking the piece--not that you need my "support," but you know what I mean). (You're right, having the text of the poem available as a handout would make sense and not have to lead to subtitles). My only thought right now is that what you're revealing in this documentary is doubly important in the post-election climate with this guy (I am trying to refuse to say or write his name for the next 4 years) as president-elect. All of the anti-semitism that'll be in the white house now, along with everything else. Many have been drawing comparisons between Hitler & his inner ring with DT & Bannon, Giuliani, etc. In some ways the comparison is problematic, obviously, and people are getting censored for it (at least one professor was let go recently for making the comparison in class). But in other ways I personally don't think the comparison is entirely off the mark. In any case, recent events have lent an entirely new layer of concern and urgency to your video. As for the plexiglass pieces, I find them intriguing, but wd need to see them in person I think to get a better sense of the layers, the physicality. I think your concentration camp painting has evolved in the right way--the added black clusters and finger streaks have introduced more depth (is that what you mean by "structure"? ), anger, chaos, whereas the earlier versions of the canvas were quieter, with less depth or dimensionality. (I wonder though if the "angry" black parts want to lead off of the frame more--there's a sense of space running around the perimeter of this piece that still seems to control or contain the chaos of the added black. I'm wondering what a pinch more chaos might do (I'm sounding now as if this is some kind of soup recipe). BUT the most exciting thing for me here (aside from your exhibit, and the article, and the cover, etc etc--how really very exciting!) is the evolution of your "structure piece"--how it moves from the rather tame, early canvas (w/its deKooningesque pinks and squiggles) and then builds up to the radically altered final piece. Which I absolutely love. I would personally get a lot out of it if you were to give a presentation one of these days on the development of this particular painting, start to finish. That would be fascinating.